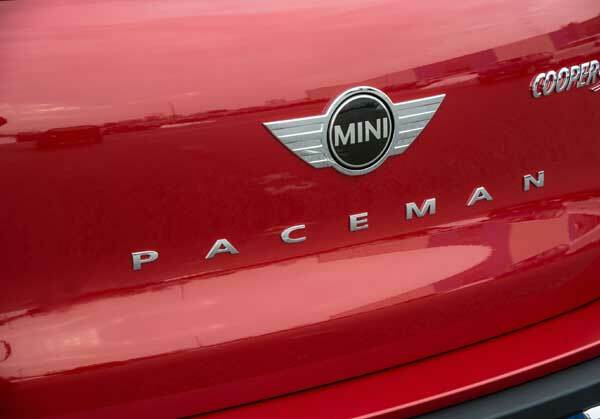 Mini has unveiled a new concept which could in the future become a new addition to their Paceman line-up. 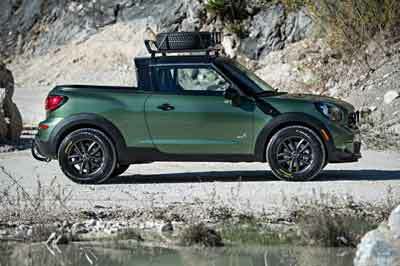 The Paceman Adventure is a two-seater pickup that was designed by BMW Group’s young apprentices. The Adventure is based on the Mini Cooper S Paceman, but the whole rear of the car was changed to accommodate a big pick up boot. To achieve this new form factor, the apprentices had to shorten the cabin and remove the rear seats from the Mini Cooper S Paceman to make way for an open load area. The open load area has a drop down tail gate, but because the Paceman isn’t the longest car on the planet, in the real-world the open load area would be limited in what it could do. 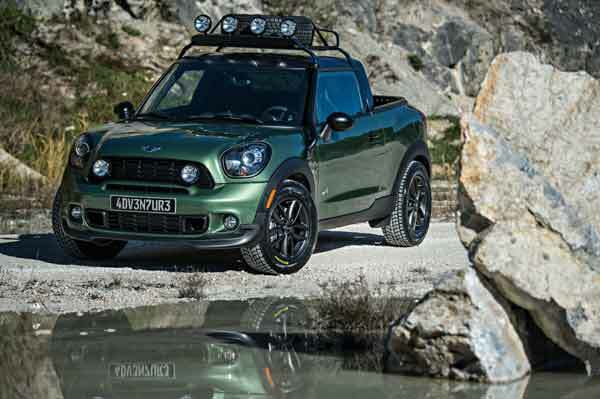 Some of the most intriguing aspects of this car include the “snorkel-like” air intake at roof level which helps the Paceman Adventure tackle high water levels. The military currently uses this feature in some of their off roaders. Another interesting feature is the modified chassis, which has improved ground clearance over a standard Paceman. 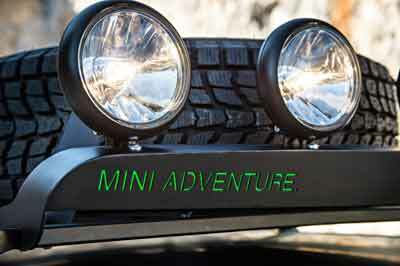 The chassis has been designed to offer maximum stability on gravel and dirt, and the vehicle is also fitted with deep-tread off-road tyres. This concept is also equipped with BMW’s ALL4 all-wheel-drive system, making the Paceman Adventure a formidable off-road machine. The BMW Group apprentices finished off their concept with a dash of gorgeous dark green metallic paint called ‘Jungle Green’ and there are four lights on the roof for added visibility, along with a strapped down spare tyre. There are also unique alloy wheels with this car painted in black. Power comes from an unmodified 1.6-litre turbocharged petrol engine that develops 181 bhp and 260Nm of torque – this is the same engine as in the Cooper S, but it is likely that if this were ever to be released, BMW Group would squeeze more torque out of the engine to cope with the weight of the ALL4 system. A six-speed manual gearbox is fitted to the Adventure as standard. Sadly, as cool as this concept is, BMW has no plans to release it as there would not be many customers enquiring with Bristol Street Motors. The Mini Paceman Adventure is simply a concept for now, but even so, BMW Group apprentices can be proud of themselves for designing such a splendid machine. 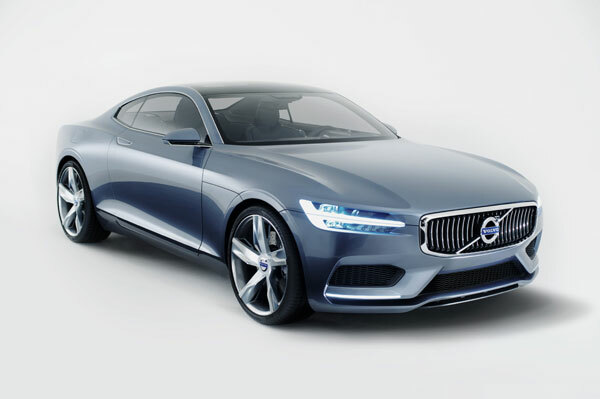 It would certainly be very interesting to see one of these beasts compete in an amateur rally or off-road event. It isn’t all bad new though. 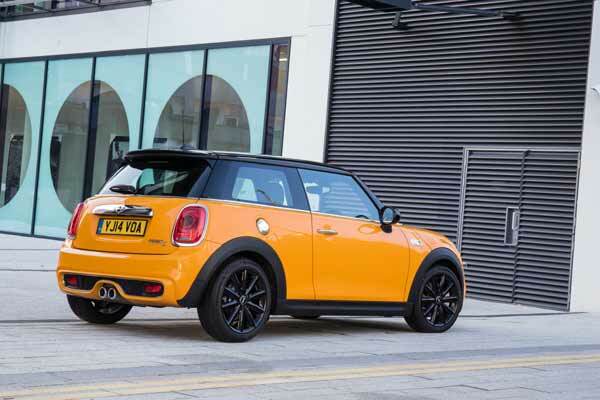 The Mini Paceman recently received a facelift for 2014 and the all-new Mini hatchback was recently updated too, with a much fresher interior, improved ride quality, and an interesting 1.5-litre diesel engine that promises superb economy. If you must have a Mini pick up, you could always buy a Paceman and spend your own money to convert it… there’s bound to be somebody out there who would do it for you.